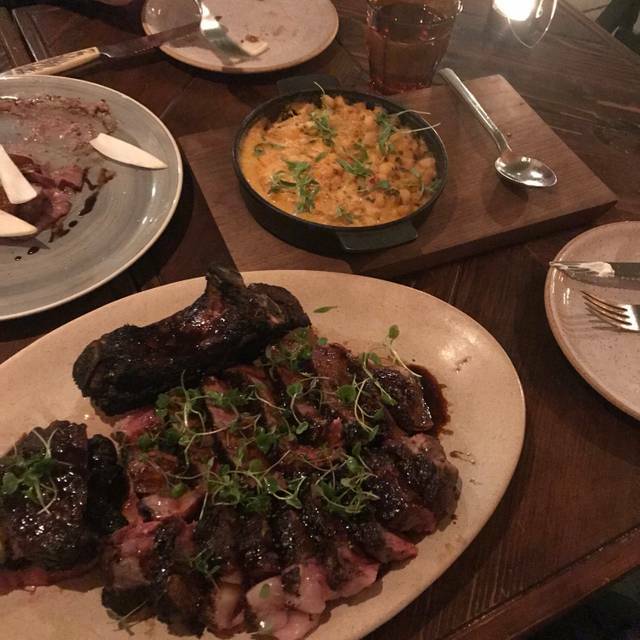 A New American restaurant and cocktail bar with a focus on market driven live-fire cooking, Campfire is a return to the origins of cooking and hospitality, and celebrates the spirit of the name by creating an environment in which we gather around a fire, create honest food, and share it with friends. Great service! Our waitress Paulina has attentive and knowledgeable. Food was delicious as always. The beet gin cocktail was amazing! And love to end the meal with the delicious s’mores. The food selection was appealing and diverse. My wife and I had the brisket and ban mi sandwiches. It was very delicious. However, I was hoping for a little better setting. It felt a little bit claustrophobic. I reserved an outside table but got an inside table. It would've been nice to have some sun. Overall it was enjoyable. Almost perfect. But missed a drink order so not giving it 5 stars. AlwAys enjoyable. Great veggie options! Fantastic food and service... Thanks Ellias! Nice decor and ambience. People were friendly and attentive. The “camping” theme around the restaurant is unique and interesting. On the other hand, kitchen was quite slow and we waited more than 15 mins for our lunch even the restaurant was just half packed. One of the best dining experiences in awhile. Super food and terrific staff! Food was fantastic. Service was not. Just celebrated a friend's birthday at Campfire - her first visit, my second. It was everything we hoped and then some. From the friendly and professional greeting at reception, to our servers and busboy, we could not have asked for nicer, more pleasant staff. Nothing was too much trouble, even when I asked to swap beans for farro with the whole roasted branzino. And the resulting combo was to die for - thank you, Chef! 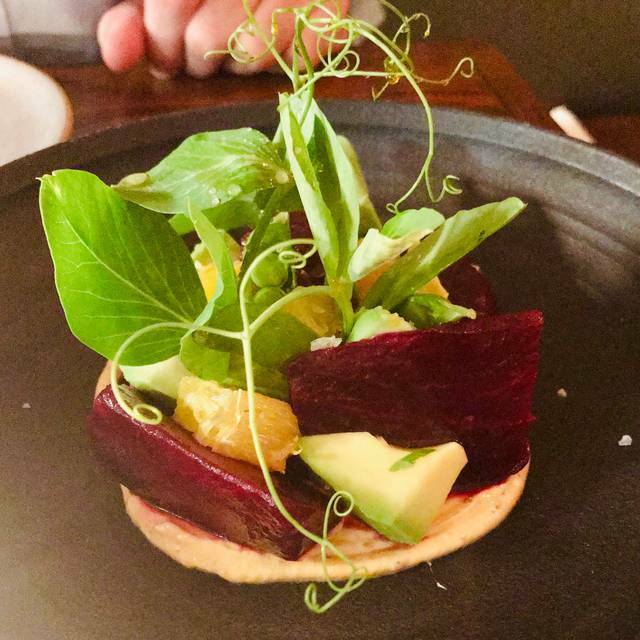 My friend absolutely loved the beet salad (f you're a beet lover, it's a must try), and the duck liver mouse with port and fig was decadent and smooth as silk. The cavatelli with sausage and crisp veg was so different, and so good. Needless to say, we barely had room for dessert, but just had to try the s'mores, and did not regret it (although we did roll out of there afterwards). It was getting late, but we were having such a nice time we moved over to the campfire to warm up a bit and keep the fun going a little longer. It's pretty noisy, especially indoors, so if that's an issue for you ask to sit outside. Now that the nights are a little warmer the heaters will keep you comfortable, and then grab your coffee (nicely served in a french press) and sit by the fire. Can't wait to return! We took our family who was visiting from the East Coast and everyone was very satisfied with the food and amicable service! What a jewel! We were looking for good food, but didn’t expect It to be such a feast! We didn’t have such an excellent experience in a long time. It made our day (and spoiled us for the rest of our holiday). We loved the “glamping” atmosphere at Campfire! First, the service is excellent! We were designated a server as well as a person dedicated to simply filling waters and clearing finished plates - an excellent system that was executed BEAUTIFULLY. 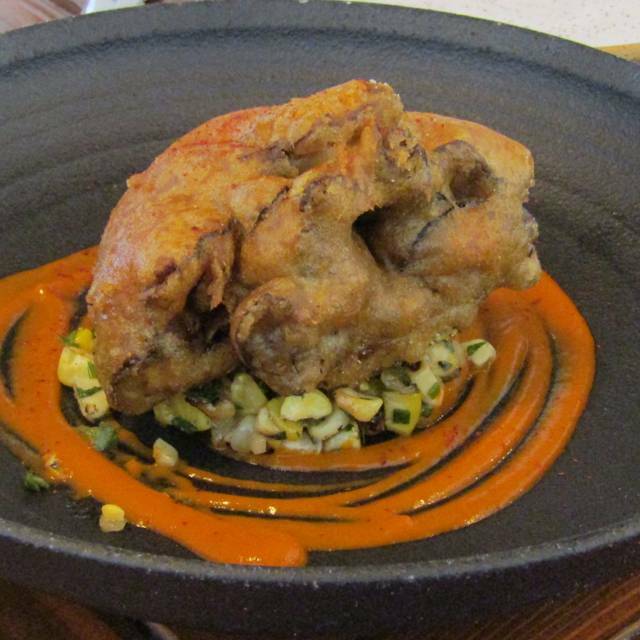 Everything is made in-house and the flavors, textures, and presentation were all wonderful! We ordered the broccoli (yes, it’s everything people say it is), the meat pie, cavetelli, salmon, and a salad with ponzu sauce (really good salad!). All dishes were incredible but our favorite was the tender meat pie. For dessert we ordered the s’mores. 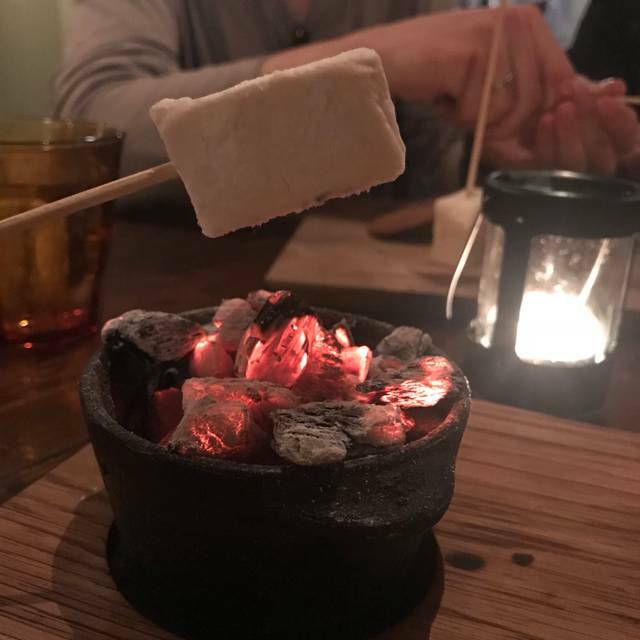 What a great experience to brown homemade marshmallows over a tiny fire at the table! I loved the homemade chocolate - my husband thought the flavor was off on the chocolate for him but still good. The only change we would make was that the s’mores cookies were more of a cinnamon-sugar cookie and we thought a homemade graham would have been better (as the cookies were just too sweet). Excellent experience we will recommend it to everyone! One of the better restaurants in North County that I have ever been too. The Wagyu was amazing, and my family all loved their Whole fishes. Also, the Fish Board was fantastic. Highly recommended. Hostess was not kind. She treated our party of four poorly. 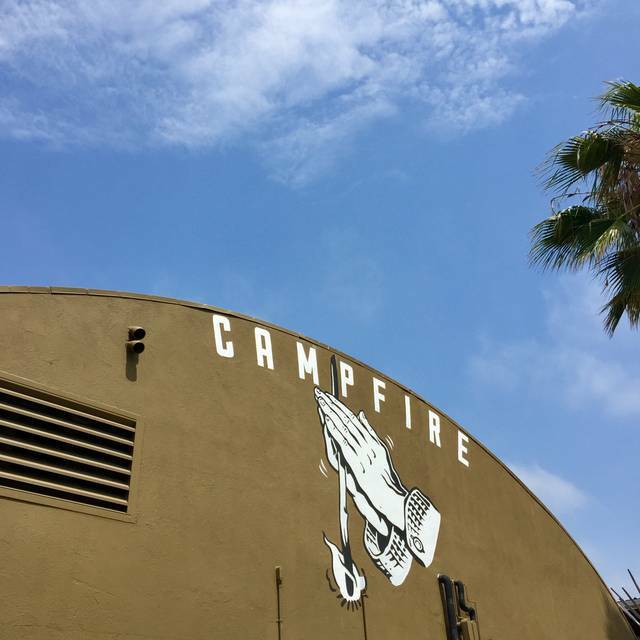 We had such a pleasant first experience at Campfire! We went to celebrate my husband's birthday. The food we ordered was delicious and the drinks were great as well. They rotate their menu so the drinks/food menu will change often. We did have a minor issue with one of the dishes we ordered - it was absolutely no big deal to us but the manager came by and went above and beyond our expectations to make sure our overall experience was still positive (which it was, regardless!). She was very sweet and seemed to show genuine concern. Our waiter, Max (?) was very attentive to us although it was a very busy Saturday night. Thank you so much for the wonderful experience ! Would definitely come here again. A wonderful smokey smell welcomes you to Campfire. Flush with lively chatter and happy guests, the environment was friendly and inviting. Our 4-top enjoyed shared dishes of whole fish (request head and tails removed), wax beans (best side dish! ), ceviche, oysters and broccoli. 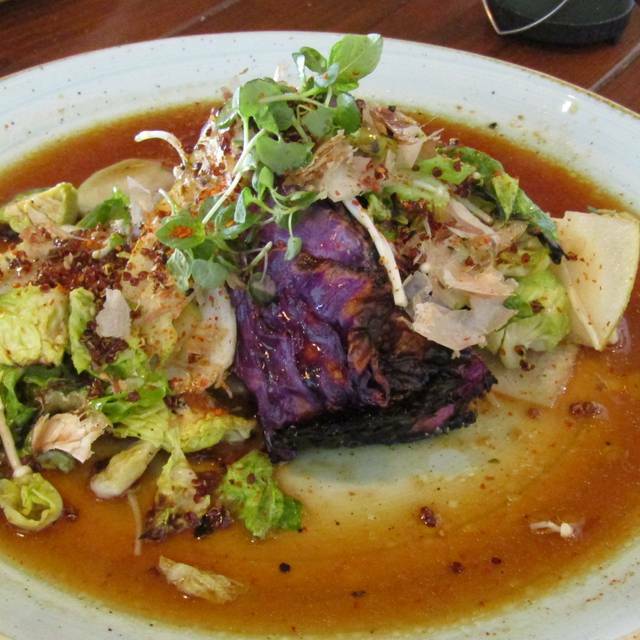 The charred, smokiness made the meal very tasteful and satisfying. Our server was fantastic, offering explanations on the various side dishes and recommending choices to make our meal complete. Not to miss- the table made s'mores with gingersnaps. Creative approach to menu items, great service & comfortable ambience. Loved Campfire! Our first visit and won't be our last! Excellent food with a different flavor and flair. Great service, good wine. Thanks, Campfire! Food and service were outstanding. Very busy place so that made service a little slow, but staff was amazing! The flavors. I've yet to have a dish that I didn't love. Delivery of fresh, original and fantastic combinations that are just purely a joy to experience. Just go with an open mind and a hungry appetite, because this is the place to come hungry. Also, it's a no guilt meal. So many fantastic options. Whether you're gluten free or allergies or vegan or vegetarian...or open to all, you can dine here and enjoy. Brought my BF here for her bday and got to watch her experience Campfire for the first time. So much fun. Of course we had to eat at 5:00, as our rezzie was made late, but it didn't matter. Gave us plenty of time to wine and dine and then walk around after. I miss the elote dessert. It was sooooooooooooo good. Please bring it back. HUGE fan. This is my absolute favorite restaurant. When we arrived the server assigned to our table was either on a break or something and we mistakenly were served mineral water. Not only did they let us keep it free of charge, but for the mix up they comped our first round of drinks and the server who is literally the best (briana I think) let us try her favorite cocktail which was delicious. 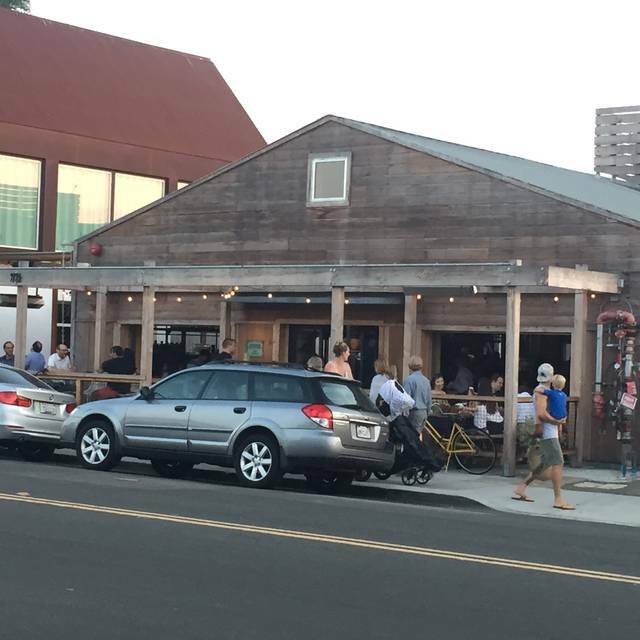 Best restaurant in San Diego ! Waitress was very attentive but too much confusion with our order! Kept getting other tables meals...long wait for food, over 1 hour, ! Food was very tasty ..... small portions but good. Such delicious food. Unique take on favorites. Tasty cocktails. Really cute style. Parking is easy to find. First time, out of towners, but will definitely come back. 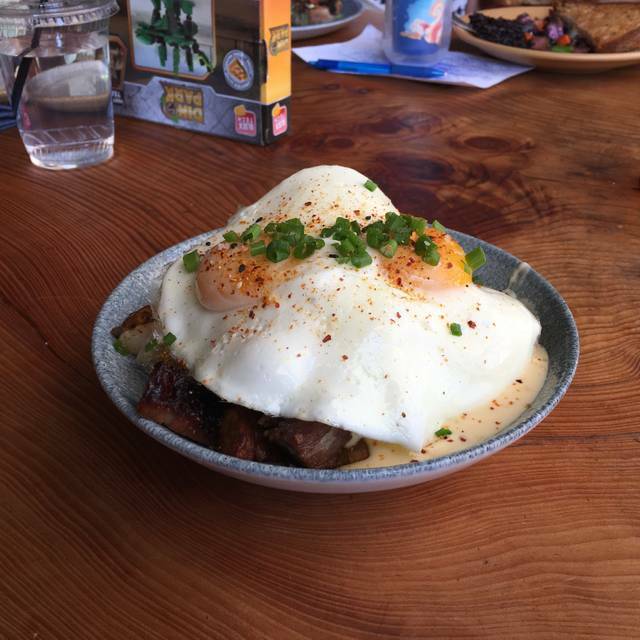 Brunch was outstanding and so was the service, start to finish. It was good, food selection is limited and service was slow. The reviews are misleading it’s not as great as the hype. Overpriced, small portions, and the most confusing menu I’ve read in quite a long time. One positive is that I learned at least 6 new words as I needed a translator to understand what was listed on the menu. I had no idea there was more than one way to say “cabbage”. Ordered the dinner for two, seasoned chicken, the chicken came out raw in some areas. Probably better to order seafood here. One of my favorite restaurants! Food is delicious and creative, although I thought the serving sizes were on the small side. Went there to celebrate my friend’s birthday and made reservations well in advance as this is a current hotspot. The menu is very unusual and a bit pricey so this may not be a good choice for families with small children. Our server, Jessie, did a great job of describing and recommending dishes. The chopped salad is a must. 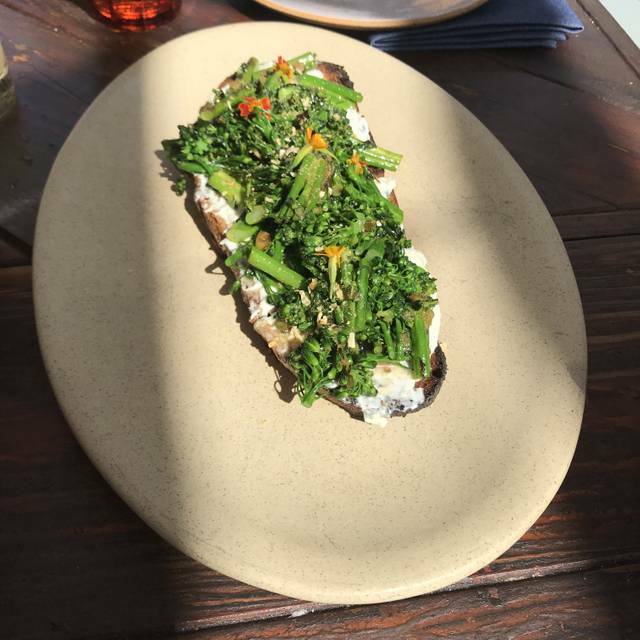 We also had the roasted broccoli. My friend ordered the Waygu beef and I had the fillet mignon which was tender and cooked to perfection. Oh, and don’t miss the soda bread, I couldn’t stop eating it. We were very satisfied with everything. The service is excellent, attentive without being intrusive. Though we chose an indoor table, there is plenty of outdoor seating, especially popular this time of year, complete with campfires and even a tepee! I would definitely recommend. Seriously enjoyed this restaurant. Interesting, fun, and delicious cocktails, the food was outstanding, great service, and fun atmosphere. Loved it. Great food and experience. Service was a bit harried (servers were very busy). The food was delicious. I had the roasted broccoli and steak. My son had the steak off the kids menu. Both were really delicious. We had to have s’mores of course with the home made marshmallows. YUM! Portions were a bit small (but delicious), so do family-style or get a bunch of apps before your main course.